Kara received her Bachelors of Science from University of Massachusetts with a concentration in Kinesiology. She went on to earn to Doctorate of Physical from Simmons College. 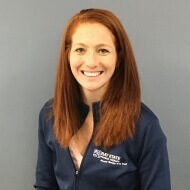 Kara has gained experience working with patients of all ages and varying diagnoses through her clinical internships including rotations in outpatient orthopedics and neuromuscular, inpatient rehabilitation hospital, pediatrics in the public school system. Kara is an active & highly motivated therapist. In her off time, Kara enjoys the outdoors (including skiing and spending time at the beach), traveling, shopping and working out.